More and more educational opportunities are becoming available for genetic genealogists. Week long courses offered at several institutes are available. How do you decide which course is best for you? How do you prepare to get the most from an institute course? Blaine Bettinger, CeCe Moore, and I worked together to put together the first week-long course in the U.S. "Practical Genetic Genealogy" was offered at the Genealogical Research Institute of Pittsburgh (GRIP) in July 2014. As best we can determine, it was the first in the world. This course, the DNA Day offered at SoCal Jamboree in 2013, the Institute for Genetic Genealogy (I4GG)'s International Genetic Genealogy Conference in August 2014, and many more genetic genealogy events have generated a lot of interest in educational opportunities. "Getting Started with Genetic Genealogy" at the 2015 Salt Lake Institute of Genealogy (SLIG). Two sessions of "Practical Genetic Genealogy" at the Genealogical Research Institute of Pittsburgh (GRIP) in June and July 2015. New instructors will be joining us in July 2015. 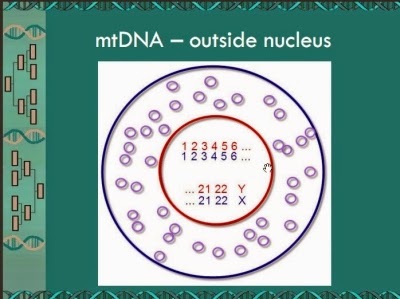 All of these courses cover Y-DNA, mtDNA, X-DNA, and atDNA topics. The depth of the material covered, the examples used, and the ancillary topics vary between the courses. The SLIG course is aimed at those who are new to genetic genealogy or someone who knows a little and wants to learn more. The focus is on using genetic genealogy for personal family history research. The SLIG course is good for someone with no or only a basic understanding of genetic genealogy. The GRIP course can also be attended by novice genetic genealogists, but some more advanced topics are covered. Topics primarily of interest to project administrators and professional genealogists working with clients are included. The GRIP course could be attended by someone with only a little understanding of genetic genealogy, but there will be some advanced topics that you may not comprehend. Learning genetic genealogy is like any other subject. You cannot go from no knowledge to subject matter expert in one week. Expertise is developed by experience over time. Each time a topic is studied some new information will be grasped. You become a better cook over time; with experience you understand techniques you could not handle as a novice. To become a better genetic genealogist requires learning the basics, putting it in to practice, then learning more advanced techniques that were not clear before you had the experience as a foundation. This cycle will continue as new DNA discoveries, tests, tools, and techniques are happening almost every day. For either the SLIG or GRIP course, any student who is willing to spend some time studying before the institute will get more from the course. The course will provide foundational knowledge. Those who already have some foundational knowledge to build on will learn even more. To prepare to learn as much as possible at an institute genetic genealogy course you should read and study at least two of the following books. Bettinger, Blaine, PhD (Biochemistry), JD and Matt Dexter. I Have the Results of My Genetic Genealogy Test, Now What? (self-published, 2008); v2.1 version with atDNA added is available from http://www.familytreedna.com/pdf-docs/Interpreting-Genetic-Genealogy-Results_web_optimized.pdf. Smolenyak, Megan Smolenyak and Ann Turner. Trace Your Roots with DNA. Emmaus, Penn., Rodale Press, 2004. Primarily covers Y-DNA and mtDNA and discoveries since 2004 are not included. Wheaton, Kelly. Beginner’s Guide to Genetic Genealogy. https://sites.google.com/site/wheatonsurname/beginners-guide-to-genetic-genealogy/. The following are a small number of the blogs available. These will also provide basic information, but may not be as complete as in the books and will not be organized as a book is. Moore, CeCe. Your Genetic Genealogist. http://www.yourgeneticgenealogist.com/. Wayne, Debbie Parker. Deb's Delvings. http://debsdelvings.blogspot.com/. Keep up with announcements of any future offerings through the institutes, blogs, mail lists, forums, and Facebook posts by genetic genealogists. Debbie Parker Wayne, "Prep for Genetic Genealogy Training at Institutes," Deb's Delvings Blog, posted 4 December 2014 (http://debsdelvings.blogspot.com/ : accessed [date]). We're excited to announce the launch of our 2014 Holiday sale! The promotion will start on November 25 (it may not be live on the site yet if you're reading this before noon Central Time) and end on December 31st @ 11:59PM Central Time. You'll find a full list of the sale prices below. And because we're in such a festive mood, we're adding a special treat to this year's great deals - Mystery Reward discounts! 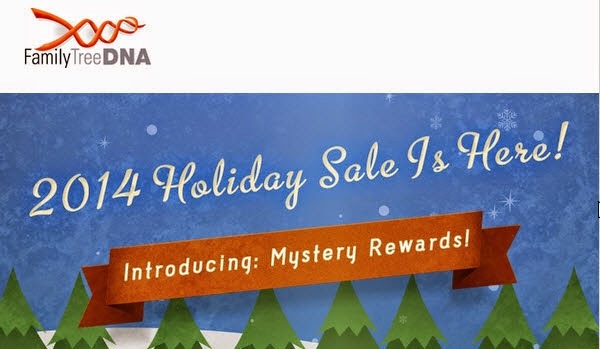 The Mystery Reward will be a randomized discount (up to $100 off) that can be applied on top of the already reduced Holiday Sale prices. 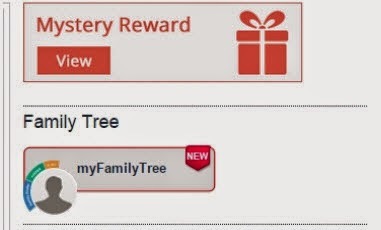 Best of all, you’ll get a new Mystery Reward every week. You can use the discounts or share them with friends! 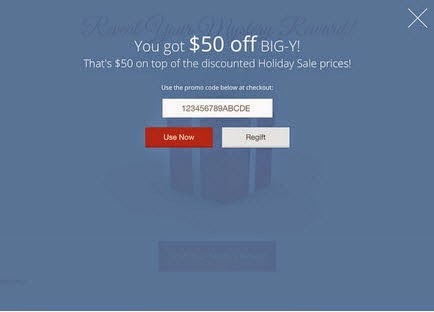 The Mystery Rewards include both product-specific and total-purchase discounts ranging from $5 - $100 (including one for $49 off a Family Finder!) and are randomly assigned to each kit. That means not everyone gets the same reward at the same time. 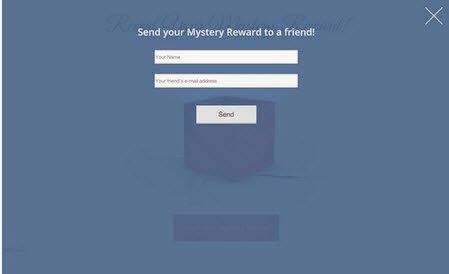 When you open the Mystery Reward, you’ll see a code to be used at checkout, whether it’s on your own kit or someone else’s. In addition, all customers who have purchased the Big Y test will receive a $50 off coupon for a Big Y test, good through Dec. 31st. Note: Only one coupon can be used per purchase. Finally, remember that the FTDNA offices are closed the Friday after Thanksgiving. If you call and leave a message, it’s critical that you speak clearly. Please be sure to leave your contact phone number and/or email address, and the group or kit number about which you’re calling. As always, if an attempt is made during the sale period to contact us about a purchase, we will honor the sale price - and in this case, the coupon price, too. Thank you all for your support throughout the year, and happy holidays from the team at Family Tree DNA! Debbie Parker Wayne, "Holiday Sales on DNA Tests at Family Tree DNA," Deb's Delvings Blog, posted 25 November 2014 (http://debsdelvings.blogspot.com/ : accessed [date]). We've opened a few more seats in the Getting Started with Genetic Genealogy course being offered in January at the 2015 Salt Lake Institute of Genealogy (SLIG). The website is not handling these last minute openings. Contact Valerie Hansen, SLIG Registrar at sligregistrar@ugagenealogy.org if you are interested and to determine if seats are still available. SLIG announced this on their Facebook page recently so some of the seats may have been taken. Consider getting on the waiting list as there is always a possibility someone registered may have to cancel thereby opening up a seat. The Getting Started course will help those with little or no genetic genealogy experience learn the basics. We'll also cover some intermediate level analysis techniques for genetic genealogy. Basics of Y-DNA, mitochondrial DNA, X-DNA, and autosomal DNA will be covered. Hands-on exercises illustrate how to integrate the DNA test results with your genealogical research. The focus is on using DNA for genealogy, covering only as much biology as a genealogist needs to understand. Sessions are taught by me (Debbie Parker Wayne), CeCe Moore, and Blaine Bettinger. See the SLIG website at http://www.infouga.org/cpage.php?pt=42 for more information. Debbie Parker Wayne, "Openings in Getting Started with Genetic Genealogy at SLIG 2015," Deb's Delvings Blog, posted 12 November 2014 (http://debsdelvings.blogspot.com/ : accessed [date]). The following announcement was distributed by the Board for Certification of Genealogists® (BCG). If you will be in Salt Lake City on 11 October, be sure to take advantage of these informative lectures by some of the best speakers. Top genealogists Elissa Scalise Powell, Judy G. Russell, Elizabeth Shown Mills, and Stefani Evans will present six lectures at the Family History Library’s Floor B2 classroom in Salt Lake City Saturday, October 11, between 9 am and 4:45 pm. The lectures are free and open to the public, sponsored by the Board for Certification of Genealogists. The board is an independent certifying body and author of the updated 2014 Genealogy Standards. Debbie Parker Wayne, "Free Genealogy Education from BCG, 11 October 2015, SLC," Deb's Delvings Blog, posted 28 September 2014 (http://debsdelvings.blogspot.com/ : accessed [date]). The Salt Lake Institute of Genealogy (SLIG) just sent out a reminder that 31 October 2014 is the deadline to receive the Early Bird Registration discount for the January 2015 courses. 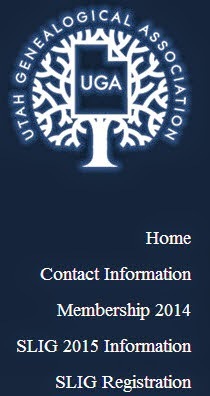 The Salt Lake Institute of Genealogy (SLIG) will be held January 12-16, 2015. All courses and events will be held at the Hilton Salt Lake City Center Hotel. Labs, if applicable, and research facilities will be available at the Family History Library. Early-bird registration ends on October 31, 2014. If you log in as a member first your information will be populated and you will be automatically charged the reduced rate. If you are a non-UGA member you may purchase a membership, register as a non-member, and be refunded the difference. If you have questions please call the main UGA phone number at (801) 259-4172 or email sligdirector AT ugagenealogy.org. You will be given the option to pay by credit card using PayPal (you do not have to have a PayPal account) or by sending a check. Tuition is $375 for UGA members and $425 for non-members (a $50 savings). You MUST be logged in to the member’s area of the website prior to registering to receive the member discount. These tuition prices are applicable through October 31, 2014 when early-bird registration expires. (After October 31, 2014, tuition is $425 for UGA members and $475 for non-members). Two payment options are available: pay online with your credit card via PayPal or pay via check through the mail. Your place in the course is reserved upon checkout. We recommend staying at the conference hotel, the Hilton Salt Lake City Center in order to obtain the full institute experience and have access to special events and networking with the instructors and other attendees. SLIG’s reduced rate is $129/night (reduced from $269/night). This rate is set for up to four people in a room. The rooms are spacious and a two-queen room can comfortably accommodate four people. This course explores repositories of original historical sources: archives, courthouses and manuscript collections. The purpose of this course is to take the mystery and trepidation out of using original source repositories. This course covers the key historical sources and research methodologies for family historians tracing immigrant origins. We explore chain migration, ethnic migration paths, surname localization, DNA evidence, cluster genealogy, and other tools to help find your immigrant’s ancestral village. Wars by their nature create records; however records are created in the aftermath of war also. There is the pension application file(s) or a bounty land application file(s). But there is so much more in addition to these records. 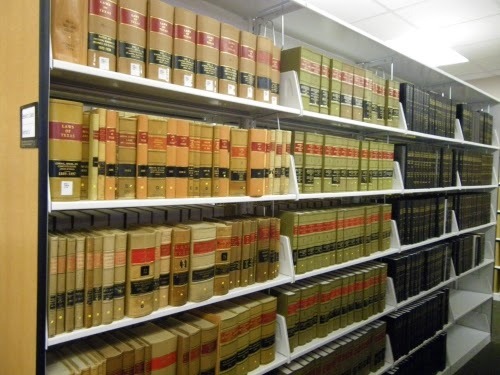 There is pension law, payment ledgers, payment vouchers, public and private claims, correspondence, state claims, soldiers homes, and burial records. This course will cover these topics in-depth. This course provides in-depth study of 19th-21st century U.S. resources and methodologies for utilizing them. Analyze content, origin, location, and develop tools and strategies to interpret records. The course will cover the basic legal concepts and legal research approaches appropriate for genealogists and will require the student to employ these concepts with hands on exercises using the resources of the FHL. Topics will include courts and their records, estate laws, legislative records, pensions, and property law. Additionally, elements of both English common law and Roman law will be introduced through classes on the legal concepts found in Irish, German, and French law that relate to research in those countries and their relevance to research in the United States. When encountering New England roots, many find a rich treasure of previous research, compiled materials, and records dating back to the early 1600s. Yet, within the branches of our New England roots exist assumptions, errors, missing individuals, and incomplete information. Starting with the colonial period and moving to the 1850s, “Diving Deeper into New England” will take an in-depth look at New England research, specifically focusing on little-known and underused sources. This course provides genealogists with the knowledge needed to correctly incorporate DNA results into their family history. Beginners will receive foundational knowledge in the basics needed to understand the application of genetics for genealogical research purposes. Those with prior knowledge of DNA will be able fill in holes in understanding and be introduced to tools and techniques with practical, hands-on exercises. This advanced analysis coursei s intended for the genealogist who has a thorough understanding of genetic genealogy basics and has experience applying DNA testing to family history research. This is the next step in genetic genealogy education, with a focus on preparing professionals and others to work on genetic genealogy cases and strengthen the skills of those who are already doing so. A comprehensive course on German research taught by one of the best researchers in this area. When the research is over, what next? How do genealogists transform the three-dimensional complexity of evidence into a coherent, understandable, written proof argument? Students in “Advanced Genealogical Methods” will learn how to use and assemble evidence to rediscover ancestral origins, identities, and relationships that have been forgotten in the passage of time. The course will address advanced use of evidence from a variety of genealogical records and research in populations for which the usual records are in short supply (including female, enslaved, and impoverished ancestors). Students also will learn how to develop written proof summaries to show their conclusions’ accuracy and create a credible record of their findings for present and future generations of family historians. Disclosure: I will be one of the speakers at SLIG in January 2015 teaching Getting Started with Genetic Genealogy with CeCe Moore and Blaine Bettinger. Debbie Parker Wayne, "SLIG 2015 Early Bird Deadline is October 31," Deb's Delvings Blog, posted 25 September 2014 (http://debsdelvings.blogspot.com/ : accessed [date]). Over 400 attendees plus speakers attended the first International Conference for Genetic Genealogy in the Washington, DC, area in August 2014. The conference was organized by the Institute for Genetic Genealogy (I4GG). Most of the sessions were recorded and are now available at a great price! Over 27 hours of education for $50.00 (USD). The videos from the 2014 International Genetic Genealogy Conference are now available for sale for those of you who were not able to attend this event. CeCe's spouse Lennart Martinsson has spent many hours editing these videos and getting them ready for you to view. Access to the videos may be purchased at http://i4gg.org/pricing. The quality of the videos that were shot in the Aiton Auditorium are generally of higher quality than the videos that were shot in the Ohio Room both from a video standpoint and an audio standpoint. We did not have permission to videotape Spencer Well's presentation or Angie Bush's presentation. We videotaped Jim Bartlett's presentation, but unfortunately the video card that held that presentation was somehow faulty and we were unable to recover the video of that presentation. Fortunately, much of the material that Jim covered in his presentation was also included in his portion of the FTDNA workshop video. We are only distributing links to the videos to those who paid a registration fee for the conference and to the speakers. If you purchase access to the videos we would appreciate it if you would not share the links to the videos with other people who did not attend the conference. If you share the links to the videos with others who did not attend the conference then this will deprive the speakers from additional revenue from the sale of the videos that they would otherwise be receiving. We have tried to make the prices for the videos as reasonable as we possibly can. If people who did not attend the conference ask you for more information about how to gain access to the videos, please refer them to the Institute for Genetic Genealogy website. 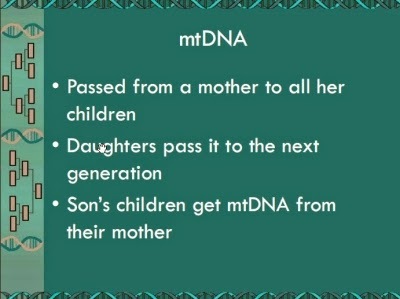 My presentation on mitochondrial DNA (mtDNA) was the first session on Saturday. I started speaking at the start time listed in the conference presentation. Apparently the camera wasn't recording yet, but I wasn't aware of that. There is a little shakiness at the beginning of the video as the camera operator moves the camera around to get it situated. The first three slides aren't recorded. I hope this helps anyone who views the video. I cannot wait to find time to view all of the sessions I could not attend in person and review some of the ones I did see in person. I hope those of you who could not attend find the videos useful. Some of the sessions have advanced content with discussions about intricate details of DNA analysis by those who have been involved in the science for over a decade. Don't let those scare you away from genetic genealogy. Start with the beginner sessions if you are new to genetic genealogy. You can come back and view those advanced sessions later on when you are ready. I hope this model of making recordings available at a very reasonable price takes off. It would be great if we see something similar from other institutes and conferences. I suspect the low price for you to access the videos is primarily due to the time donated by Lennart Martinsson. Thank you, Lennart, for supporting genetic genealogy in this way. CeCe and Tim are planning another I4GG conference and will announce it when details are available. They may rotate the conference from east to west coast in the U.S. I've also heard some people asking for conferences to be held outside of the U.S. So stay alert for future announcements. This is a conference you do not want to miss! Some speakers made handouts available to accompany the video. Some made copies of the slide presentations available. Some did both. All the options provide a great educational experience that helps us all advance our knowledge of genetic genealogy. Go forth and learn! Disclosure: The speakers, including me, were paid to present at this conference and were compensated for some travel costs. Additional fees may be paid to the speakers based on sales of the videos. 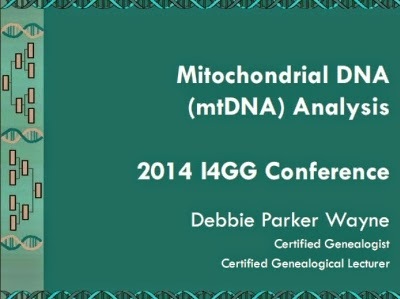 Debbie Parker Wayne, "Genetic Genealogy Education: I4GG 2014 Conference Videos," Deb's Delvings Blog, posted 21 September 2014 (http://debsdelvings.blogspot.com/ : accessed [date]). I didn't see any publicity about this online until today when a notice was placed on several Rootsweb mail lists. I hope the planners got the word out in local newspapers so the attendance will be good. If you are in the southeast Texas area this weekend maybe you can fit in one of these sessions. I am sure the speakers will appreciate your attendance. Check with the History Center and library (presumably at 213 Court Street, Newton, Texas 75966) for directions to the different venues. No addressees were included with the notice I received, but Newton is a small town and it should not be difficult to find your way around. 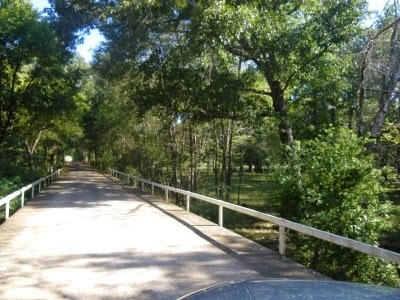 To cite this blog post: Debbie Parker Wayne, "Free Genealogy Education: Newton County, Texas FRIDAY (TODAY) and SATURDAY," Deb's Delvings Blog, posted 12 September 2014 (http://debsdelvings.blogspot.com/ : accessed [date]). International Genetic Genealogy conference sponsored by the Institute for Genetic Genealogy (I4GG) and much more. The FGS conference in San Antonio just ended. This has been a busy summer for speaking in places that require more than a short drive. So what is coming soon? And what filled the rest of the spring and summer (for completeness of the 2014 speaking schedule)? August 27 to 30, FGS in San Antonio, Texas, where I helped Elissa Scalise Powell and Judy G. Russell teach the "BCG Certification Seminar" and I presented "Texas Resource Gems," "DNA Case Studies," and "Using mtDNA and X-DNA"
August 9, Huntsville, Texas, where I presented "GATA GACC! DNA and Genetic Genealogy Today" and "Going Nuclear: DNA Discoveries to Trace All Lines of Descent"
June 8 to 13, IGHR at Samford University, Angela McGhie invited me to be part of her new Intermediate Course where I taught "Mining Tax Rolls: More than Property Lists," "Directory Assistance: Using City and Other Directories," and "DNA and Genetic Genealogy, GATA GACC!" May 19, Angelina County Genealogical Society, Lufkin, Texas, where I presented "DNA Case Studies"
May 7 to 10, NGS in Richmond, Virginia, where I worked the BCG Education Fund workshops, helped Elissa Scalise Powell and Judy G. Russell teach the "BCG Certification Seminar" and I presented "DNA Case Studies"
April 14, Cherokee County Genealogical Society, Jacksonville, Texas, where I presented "Tax and Land Laws"
April 5, Houston Genealogical Forum, Houston, Texas, where I presented an expanded version of "Tax and Land Laws"
March 11, Illinois State Genealogical Society, webinar on "Going Nuclear: DNA Discoveries to Trace All Lines of Descent"
I definitely have good intentions of blogging about the upcoming speaking engagements instead of about the ones already in the past. Keeping my fingers crossed I can make good on these intentions. And I'd love to meet you all at the upcoming events. Debbie Parker Wayne, "Upcoming Speaking Engagements (and past ones in 2014)," Deb's Delvings Blog, posted 2 September 2014 (http://debsdelvings.blogspot.com/ : accessed [date]). Here is a chance to check out some of the records on MyHeritage.com free through the end of July. MyHeritage.com offers some unique records and tools on their site. Through the end of July 2014 you can get free access to World War I records. This is to commemorate 100 years since the war started in 1914. Enjoy this free access. Take some time to explore other offerings on MyHeritage.com. For eaxmple, check out Randy Seaver's post on "Smart Matching in MyHeritage" at http://www.geneamusings.com/2011/06/smart-matching-in-myheritage.html for one of the great features offered. You may find the site is useful to your research and decide to subscribe. Debbie Parker Wayne, "MyHeritage: Free access to WWI records for a limited time," Deb's Delvings Blog, posted 13 July 2014 (http://debsdelvings.blogspot.com/ : accessed [date]). A group of genetic genealogists have been working for several months now to create a draft of Genetic Genealogy Standards. Informal discussions started much earlier, but the time seems right for formal standards to be developed as more researchers begin using DNA for genealogy. These standards do not teach how to analyze DNA data. The standards cover privacy and ethical situations we should all consider as we take a DNA test, ask relatives to take a DNA test, and as we share those test results privately and publicly. Formal discussions were led by The Genetic Genealogist blogger Blaine Bettinger. More importantly for this effort, he also holds a PhD in Biochemistry and a JD. Others in the group are from several countries, some are medical doctors, some are biologists and geneticists, some are project administrators, most are genealogists—professional, forensic, genetic, and family, or all of these—or have an interest in genealogy. A selected group of genealogists and genetic genealogists outside of the original discussion group were asked for comments prior to making the document available to the public. Blaine created a website to allow the document to be available for public comment at Genetic Genealogy Standards. Please take the time to download and review the document then use the website to provide official feedback. The feedback period ends June 15th. The more reviewers we have, the better the final document will be. Blaine blogged about this on 12 May 2014 at Announcing the Creation of Genetic Genealogy Standards. 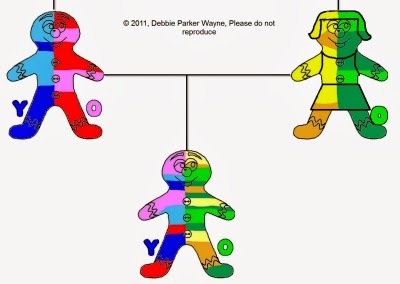 Debbie Parker Wayne, "Standards for Genetic Genealogy," Deb's Delvings Blog, posted 29 May 2014 (http://debsdelvings.blogspot.com/ : accessed [date]). I won't be able to attend the Southern California Genealogical Society Jamboree this year, but I can see some exciting sessions from the comfort of my home without airport hassles and travel costs. Yay! For details see the Jamboree Live Streaming Schedule. CeCe Moore: "Real World Stories from the Desk of a Genealogy DNA Detective"
Diahan Southard: "Lab Tour: How Your Data is Generated"
Blaine Bettinger, PhD, JD: "Using Autosomal DNA to Explore Your Ancestry"
Dr. Maurice Gleeson: "Which DNA is Best for You?" Tim Janzen, MD: "Advanced Techniques for Use of Autosomal DNA Tests to Break Through Genealogical Brick Walls"
Judy G. Russell JD, CG, CGL - "Dowered or Bound Out: Records of Widows and Orphans"
Blaine Bettinger PhD, JD - "DNA and the Genealogical Proof Standard"
Paula Stuart-Warren, CG, FUGA - "Manuscript Finding Aids: Locating Migrating Family Records"
F. Warren Bittner, CG - "Proof Arguments: How and Why"
F. Warren Bittner, CG - "Elusive Immigrant!" Judy G. Russell, JD, CG, CGL - "Staying out of Trouble: The Rights and Responsibilities of Today's Genealogist"
Michael Leclerc - "Researching Your New England Ancestors"
Bennett Greenspan - "The Future of Genetic Genealogy"
Dr. Maurice Gleeson - "Researching Your Irish Ancestry"
Cyndi Ingle - "The Internet: A Genealogist's Printing Press"
D. Joshua Taylor - "Resources of the DAR: Beyond Revolutionary War Soldiers"
Dawn Thurston - "How to Write a Personal History that Captures your Interesting Life"
Dr. Maurice Gleeson - "Ireland and the Slave Trade"
Denise Levenick - "Dirty Pictures: Save Your Family Photos from Ruin"
Debbie Parker Wayne, "SCGS Jamboree streamed and recorded sessions," Deb's Delvings Blog, posted 29 May 2014 (http://debsdelvings.blogspot.com/ : accessed [date]). This Friday through Monday, May 23-26, MyHeritage will offer free access to U.S. military records in honor of our Memorial Day. MyHeritage is a subscription site offering access to record images and databases, family trees, and many other things useful to researchers. One of those useful features is a SmartMatch service. Randy Seaver of GeneaMusings discusses the feature here http://www.geneamusings.com/2014/05/looking-for-cousins-in-myheritage-smart.html and in many other posts you can find by searching his website for "myheritage." 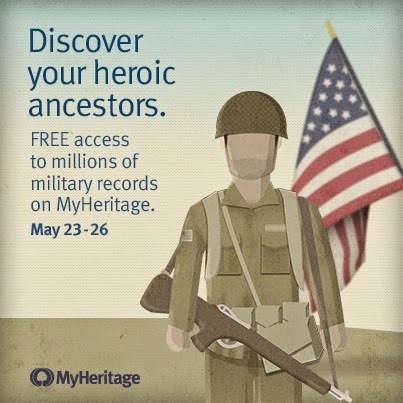 Debbie Parker Wayne, "MyHeritage offers free access to military records May 23-26," Deb's Delvings Blog, posted 19 May 2014 (http://debsdelvings.blogspot.com/ : accessed [date]). Big things happening today include the updated Y-DNA Haplotree from Family Tree DNA. The tree is being expanded from 400 to over 1000 branches and will sport a new design interface. A free webinar today at noon Central Time (5pm UTC) will provide details on and demonstrate the new tree. Register for the live webinar at http://bit.ly/1dGbbbx or catch it later when it will be posted online at http://www.familytreedna.com/learn/ftdna/webinars/. AncestryDNA is offering a $20 discount on their autosomal DNA test. 23andMe isn't advertising a sale today as they did a sale earlier this year. This is another good place for a DNA test for genealogical purposes. Check the websites of other testing companies to see what they may be offering today. But if you are ordering an autosomal test for genealogical purposes be sure you are getting a test that includes 500,000 markers or more and not one of the lower resolution tests. Debbie Parker Wayne, "DNA Day 2014," Deb's Delvings Blog, posted 25 April 2014 (http://debsdelvings.blogspot.com/ : accessed [date]). The Texas State Library and Archives Commission (TSLAC) is hosting another Genealogy After Dark program on 25 April 2014. Contact them at geninfo@tsl.state.tx.us or 512-463-5455 for more information or to register. Registration is limited to 30 and you must register by 18 April 2014. Park on the street or at the Capitol Visitors Parking Garage at 1201 San Jacinto, one block east of the Zavala Building. There is no charge for visitors who arrive after 5:00 p.m.
Debbie Parker Wayne, "TSLAC Genealogy After Dark - 25 April 2014," Deb's Delvings Blog, posted 2 April 2014 (http://debsdelvings.blogspot.com/ : accessed [date]). 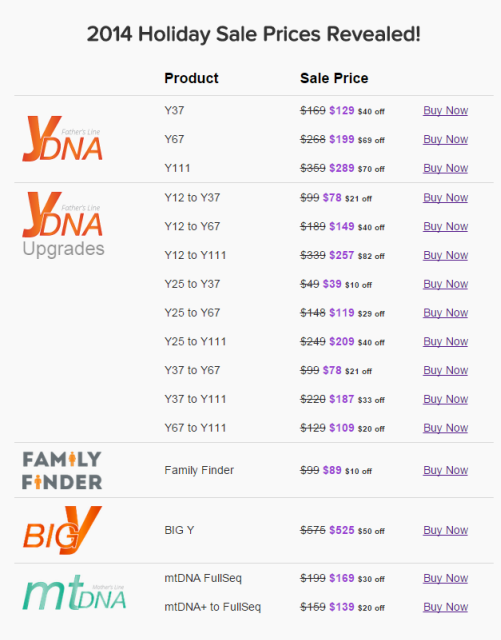 For the next four days Family Tree DNA is offering reduced prices for mtDNA full sequence test orders and upgrades. Orders must be placed and paid for before 11:59 p.m. Central Time on 1 April 2014. The Full Sequence mtDNA test is the most comprehensive mtDNA test available and is only offered by Family Tree DNA. Order Now from Family Tree DNA. We made the announcement this morning at the Forensic Genealogy Institute and several attendees immediately ordered the test after learning how to use the test results yesterday in the sessions I taught on "Forensic Techniques for Genetic Genealogy." I can't wait to hear what they learn from this test. Debbie Parker Wayne, "mtDNA Test Sale at Family Tree DNA," Deb's Delvings Blog, posted 28 March 2014 (http://debsdelvings.blogspot.com/ : accessed [date]).